Home | Blog | Technology | OPINIONCould Tech Nerf North Korea? When we have a hostile country regularly lobbing missiles into the ocean with the stated objective of transforming a U.S. state into a radioactive cloud, we have a problem. One “oops” and we could suddenly become a 49-state nation again — and that is only if we forget the issues with fallout and the potential for a nuclear winter (granted, that could be good news for the global warming folks). However, the approaches to cutting the legs out from under North Korea largely have been in-the-box thinking: economic sanctions that require China’s cooperation (and aren’t working); military and assassination options that would trigger retaliation that likely would result in a lot of us glowing at night; and revolution efforts that have little or no chance of succeeding. Still, there are companies that have been working on technologies that effectively could contain North Korea’s missiles and turn their leader into more of a vocal than a physical problem. Since I’m on the West Coast and possibly within range of his wrath, the idea of nerfing the guy appeals to me. I’ll explain how tech could nerf North Korea and close with my product of the week: a memory module from Intel called “Optane,” which is amazing. One of the big challenges with containing North Korea is geographic. It borders South Korea on the south and China on the north. The Chinese border is huge, and given the fact that China hasn’t been particularly helpful with economic sanctions, punishing the country has been problematic. Putting an impenetrable glass dome over the country would be ideal, but getting Corning to make enough Gorilla Glass for that would be problematic (though immeasurably cool). militarized the concept, though. What if it placed a constantly refreshed drone swarm over North Korea, moving it to correspond with the missile trucks and launch platforms, thus placing a swarm between the rockets and space? has been promoting the idea of drone swarms for a while. I’ll bet they could be an effective and relatively low-cost way to ensure a no-fly zone, and they would work even better for planes and jets. may have moved into the lead recently. Then again, China likely would sell us a ton of these drones cheap. Of course, we also would need a way to deploy, repair and recharge the drone swarms. has proposed a large flying structure to service drones — it would hover over cities as kind of an automated warehouse flight operations center. S.H.I.E.L.D. Helicarriers yet, Amazon’s flying warehouses would be huge. However, their cost — compared to an aircraft carrier, say — likely would be modest. Placed over North Korea at strategic locations, these flying bases likely could do a good job of making sure the drone swarms were ready to deploy. Given they could be fully automated, there would be little risk to the U.S. if they were shot down. You could surround them with defensive shields — like the Phalanx system designed for ships, or Metal Storm, which is just cool. They’d also be big enough to house a railgun, which could be effective against launch sites but likely not fast enough to topple a missile. Can you imagine the look on Kim Jong Un’s face if he were to look out his window and see Independence Day-class flying carriers moving slowly across his borders to take positions over his country? Talk about a polaroid moment. a tunneling company and is working to improve huge tunneling machines. EMPs around critical areas of the country, and then collapsed the tunnels? If North Korea should launch a missile, one flip of a switch could drop it into the pre-industrial age as a country. No lives would be lost — at least, not initially — and with the government down to hand weapons, the potential for revolution would go up rather dramatically, and almost instantly. Granted, the build time for such a system would be measured in years, and we’d constantly need to replace the EMPs found and dug up by the North Koreans, but we’d basically have a one-button grounding capability for most aircraft and any missiles that weren’t massively hardened. China have been working on militarized robotic dog-like robots for some time. These things look scary, even though that clearly isn’t a design element. It wouldn’t be particularly hard to add weapons to them and make them frightening to see. It is amazing how close we are getting to Terminator-level technology. This model, for instance, is basically a small robotic tank able to move at very high speeds. In this iteration, it is non-lethal — assuming it doesn’t scare the target to death. Imagine a few thousand of these things high-speed dropped into any country. A vacation in Switzerland suddenly might seem far more attractive than repelling an invasion. I think that technology could help provide a solution to keeping North Korea contained, though there is a risk of a “use it or lose it” mentality as the technologies were deployed that likely would need to be dealt with conventionally at first (maybe a ring of Patriot missile batteries). None of the technologies I’ve highlighted are mutually exclusive — for instance, we could have both an air-based flying drone swarm carrier and a wave of high-speed ground attack robots hitting the country at once — and, come to think of it, we could begin by firing off the underground EMPs to reduce any response severely. In the end, though — and seriously — we must stop thinking conventionally about problems like rogue nations. If Iraq and Afghanistan have taught us anything, it is that conventional weapons largely are inefficient when invading a country and containing the related problems. We have the technology, and we eventually will use it. Why not move the “use” part up so that it can be more effective against today’s problems rather than just tomorrow’s? Intel Optane memory card soon after the company launched it. It took me a while to get it working, but it was oh so worth it. 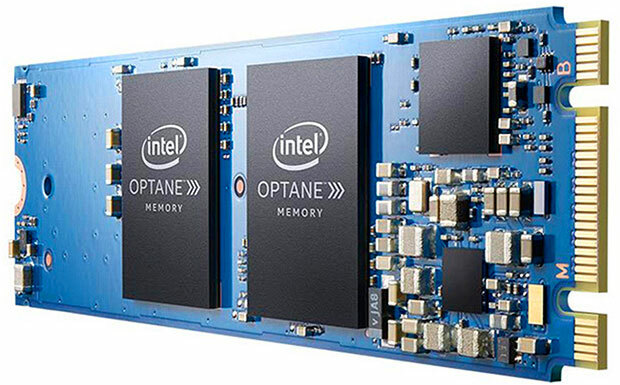 “Optane” is Intel’s brand name for 3D XPoint memory — a unique form of storage that the company shares with Micron. It comes in two sizes, 16 GB and 32 GB, which cost US$48 and $77 respectively. You can get an Optane drive, but 375 GB will set you back $2K and is a tad rich for my blood. Eventually prices will come down. Ideally, this is an option for those who want one huge magnetic drive. It functions largely as a cache now; however, you could use it as a small fast SSD drive, even though that isn’t its current ideal use. I attached it to a system with a new Samsung Evo 500-GB drive, and the load speed for my games was nothing short of amazing. (You’d see an even bigger jump with a typical large hard drive). My current game of choice is Ashes of the Singularity (which also has a decent book to go with it, by the way), and its load times, pre-Optane, were glacial. Now, the game is up after only a few seconds and I’m in it, making this one of the best $77 system values I’ve ever seen. However, be aware that Optane works only on current Intel motherboards that support it, so this is likely best if you are building a new Kaby Lake system — not as an upgrade to a system you already are pretty happy with (because the cost of a new motherboard and processor is going to set you back closer to $700 than $70, and Optane isn’t that good yet). Be aware that you also need to install a 5-MB partition at the end of your primary drive to get this to work (which turns out isn’t the easiest thing in the world to do), and it will work only with SATA drives right now — not with M.2 drives (both lessons I learned the hard way). Still, I’m overall very pleased with the Optane module — pleased enough that I’ve made it my product of the week. cialis buy online usa http://cialislet.com/ buy cialis online.